Self-defense scenarios shown in most self-defense articles demonstrate successful methods of dealing with an attack from the offset. But in the real world, sometimes you are surprised, or initially overcome before anything can be done. This doesn’t always mean you must ultimately have a negative ending. The mugging situation portrayed here is much the same. It should be noted, however, that the scenario presented here is but one of several options. It is interesting, however, since it illustrates that during an attack, even when the situation looks bad for the defender that the situation can often be turned into a success. Attacker's right hand grabs the defender's mouth and his left hand is around her waist. Defender throws her legs and body to the left away from the attacker's body. Defender's right arm falls on the attacker's right arm. The defender'sbody rotates clockwise, which throws the attacker over her body. As the defender is grabbed, pulled and lifted, she can lift her left hand over her shoulder to try to hit the attacker’s eyes (not shown). If her feet are still on the ground, she can also stomp on the attacker’s instep or heel kick to the attacker’s leg (not shown). At minimum, these actions work as distractions, so the attacker may momentarily loosen or weaken his grip. The goal for her is to be able to gain enough freedom of movement so that she can throw her feet up to the left and away from the attacker’s body. 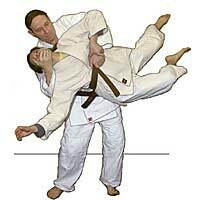 This action will disrupt the attack and off balance the attacker. 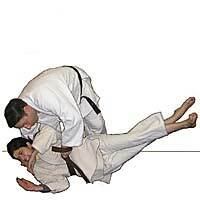 The attacker’s right arm will be extended away from his body, his elbow pointed toward the ground, as he attempts to control the defender’s body. 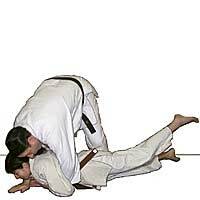 The further away the defender is able to extend her body weight away from the attacker, the weaker his body position will be. 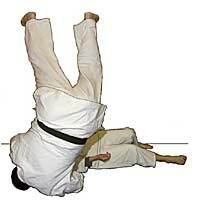 As the attacker’s body is being pulled down (as he trying to regain control over the defender), the defender’s body fall is cushioned (the fall slowed). 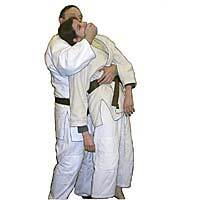 If done correctly the attacker’s right arm will hit the ground first, thereby in part shielding the defender. As the defender contacts the ground, she rolls her body clockwise, which causes the attacker to flip over her body and smash face forward on the ground. Prof. Gene Roos, 10th dan Ju Jitsu, and 4th dan in judo, is a member of the Board of Directors for the America Ju Jitsu Association. He is a frequent contributor to FightingArts.com. In 1958 was awarded Shodan (Judo) and won the Regional Judo Champion. In 1958 & 1959 was Judo State Champion. His instructors include: Harold Brosious (Ketsugo), Dennis Palumbo (Hakko Ryu Ju Jitsu, 8th Dan), George Kirby, & Shizuya Sato (Ju Jitsu), Wally Jay (Small Circle Ju Jitsu), Dr. Sacharnoski (Hard Style Ju Jitsu & Ki) and Master Mochizuki (a student of Funakoshi, Kano, & Ueshiba). He is also the author of a series of upcoming books on Aiki jujitsu as well as a number of videos including: "Aiki Jujitsu" (a three video tapes series with manuals); "Deadly Attacks" (defense against 30 knife, gun, stick and empty hand attacks); "Deadly Attacks- part II" (defense against an additional 30 knife, gun and empty hand attacks); "Deadly Attacks III" and "Devastating Throws and Other Deadly Attacks " (defense against 30 advanced combat throws, knife attacks, stick, and a rear shotgun attack), For more information see: http://www.aikijujitsu.homestead.com/aikijujitsu.html.